This wonderfully delicious recipe is from Beverly le Blanc’s new book, The Big Book of Soups. This book is literally brimming with an incredible variety of soups for all seasons and all occasions – whether you’re looking for a light soup for lunch outdoors on a summer’s day, or a thick, creamy, comfort-soup for when the weather turns cold and rainy. I love this soup because it tastes great, and is full of nutrient-dense ingredients. Watercress is a true superfood – containing more than 15 vitamins and minerals, including more calcium than milk, more vitamin C than an orange and more iron than spinach! 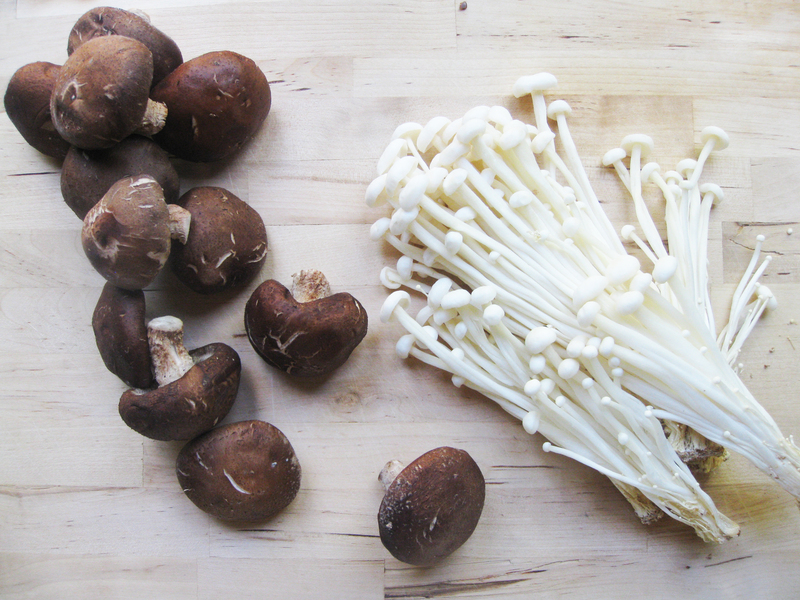 Shiitake mushrooms have been used as both food and medicine in Asia for thousands of years and is currently used in Japan to treat many conditions, including chronic fatigue syndrome. And kombu (in the dashi) is packed with minerals and phytonutrients that help detoxify your body and relieve many ailments. You can either make dashi yourself (see below for the recipe) or you can buy it ready-made from Japanese stores or from the internet. Just in case you need some instructions because they might only be in Japanese(!) you normally dissolve 2 teaspoons powder in 1.25l/44fl oz/5 cups water. You can get vegetarian versions, made without bonito (fish flakes). This recipes also uses another very Japanese ingredient, daikon, which is a long white crunchy vegetable from the radish family, with a light, peppery punch similar to watercress. To make the Dashi, put the kombu and 1.4l/48fl oz/5½ cups water in a saucepan and leave to soak for 30 minutes. Bring to the boil, uncovered. As soon as it boils, skim the surface, then add the bonito flakes. Skim the surface again, if necessary. Reduce the heat and simmer, uncovered, for 10 minutes. Strain the dashi into a large bowl and use immediately. Alternatively, leave to cool, then store in the fridge for up to 2 days. Freezing isn’t recommended for more than 2 weeks as it will lose much of its flavour. To make the soup, bring a saucepan of lightly salted water to the boil, and bring another saucepan of unsalted water to the boil. Boil the watercress in the salted water just until the leaves wilt, which will be almost instantly. Drain and immediately rinse under cold running water, then drain again and set aside. Meanwhile, boil the rice noodles in the unsalted water for 6–8 minutes, or according to the packet instructions, until tender. Drain and immediately rinse under cold running water and set aside. Put the dashi in a saucepan, cover and bring to just below the boil. Meanwhile, mix together the daikon and chilli in a small bowl and set aside. Just before the dashi boils, reduce the heat to low, add the salmon and shiitake mushrooms and simmer for 5 minutes or until the salmon is cooked to your liking. One minute before the end of the cooking, add the tofu and enoki mushrooms and simmer until the enoki are tender. Season with salt. 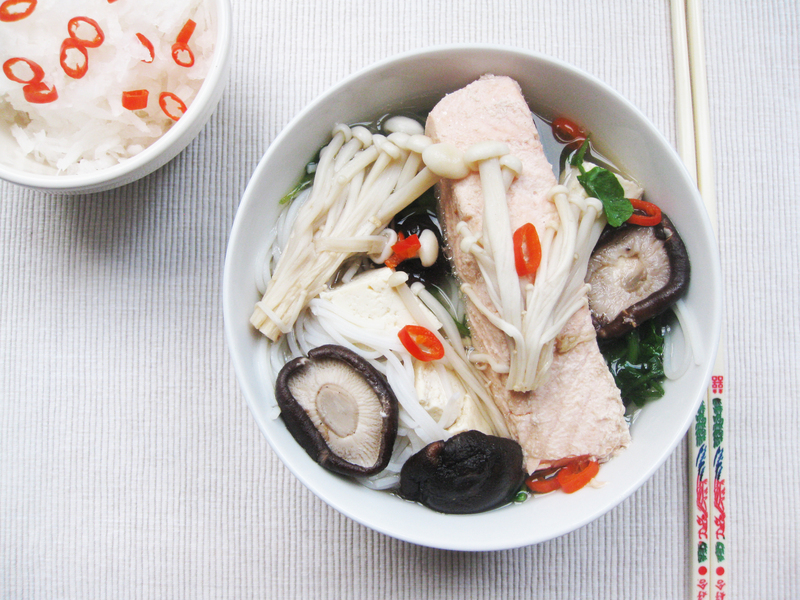 Divide the noodles into bowls and top with the salmon. Use a slotted spoon to transfer the watercress, mushrooms and tofu into the bowls. Ladle the dashi over them and serve immediately with small bowls of tamari soy sauce and the daikon and chilli mixture on the side. This is show-stopper of a meal – with a wonderful blend of tastes and aromas – and very beautiful. 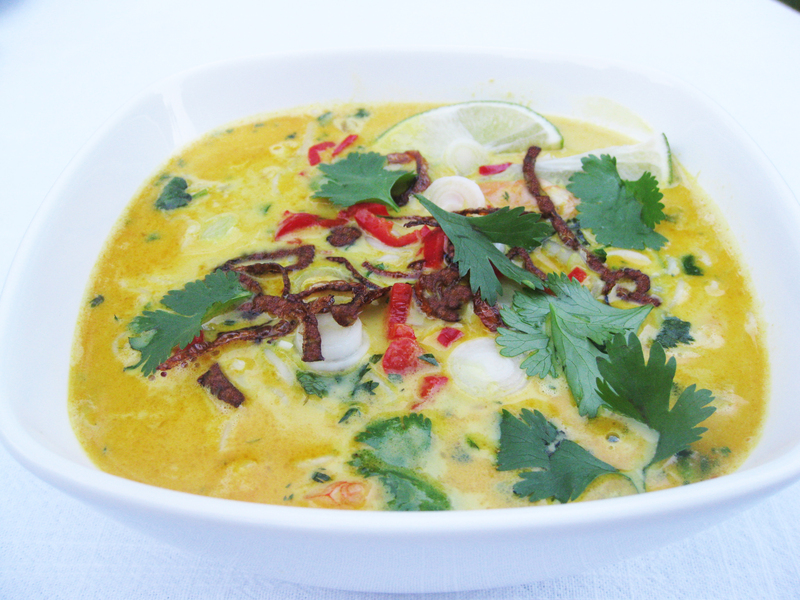 Laksa recipes can differ hugely – and I’ve made my version with far more peanuts than any laksa I’ve ever eaten. I think it gives it a wonderfully nutty base to the fiery tastes. Don’t be put off by the idea of making your own paste – it’s actually amazingly quick and easy. You simply put the ingredients in a mini-blender or mini-food processor and whiz – and you have a beautifully fresh, aromatic paste which is worlds away from the ready-made pastes you can buy. Pour the oil into a small saucepan and heat over a medium-high heat until hot. Add the sliced shallots and fry for 5–6 minutes until golden brown. Remove with a slotted spoon and put on kitchen paper. Heat a wok over a medium-high heat until hot. Add the peanuts and dry-fry for 3–4 minutes until starting to turn brown, stirring frequently. Remove from the pan, put into the bowl of a mini-blender and process until finely chopped. Remove and leave to one side. Put the ingredients for the paste into the bowl of the mini-blender or mini-food processor and blend thoroughly until the mixture becomes a paste. Pour the oil into the wok and heat over a medium heat until hot. Add the paste and stir in the chopped peanuts. Fry for 2–3 minutes, stirring frequently. Pour in the coconut cream, stock and fish sauce and stir well, whisking if necessary, to mix the coconut cream in thoroughly. Bring to the boil and simmer for 2 minutes. Meanwhile, put the rice noodles in a large, heatproof bowl, cover with boiling water and leave to stand for 5 minutes until soft. Tip into a colander and rinse well under cold running water. 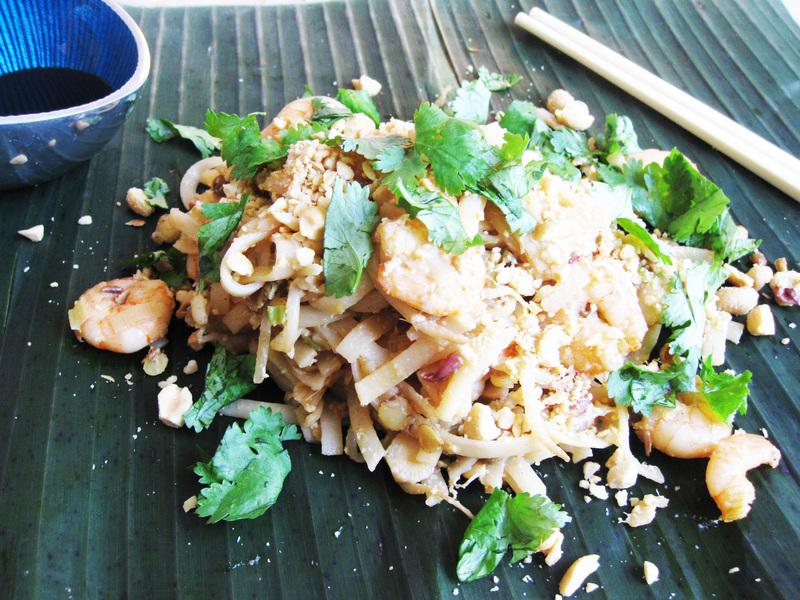 Add the rice noodles to the wok, along with the beansprouts and prawns, stir in thoroughly and cook for 2 minutes. Sprinkle in the coriander and mint and stir in gently. Serve immediately with the chopped chilli, spring onions and fried shallots sprinkled over, and served with lime quarters. 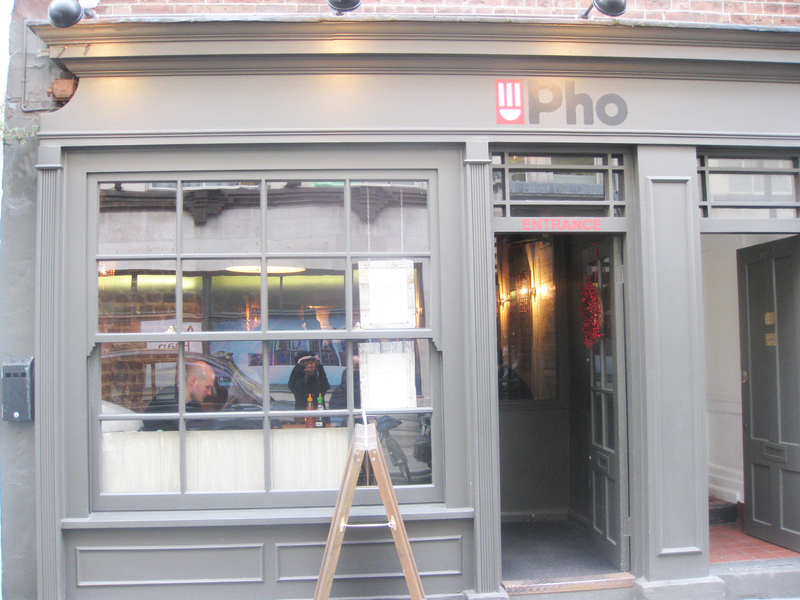 I went to Pho in Wardour Street this week and had a delicious lunch. 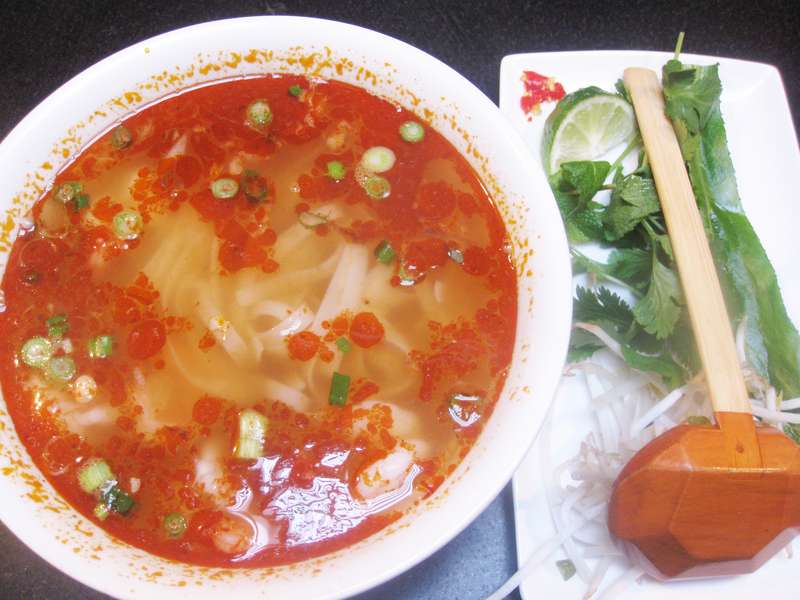 Pho is pronounced “fuh” and is Vietnam’s national dish. Often referred to as the “soul of the nation”, it’s a noodle soup dish that is made with rice noodles and various ingredients such as steak, meatballs, chicken, prawns, tofu or veggies and then served with lime, coriander, beansprouts and chillies that you add yourself. Apparently Pho originated in Hanoi and, as it travelled south through Vietnam, it developed subtle traits distinctive to the various regions, becoming influenced by the Chinese flavours in the North and then taking on more herbs, greens and chillies in the South. 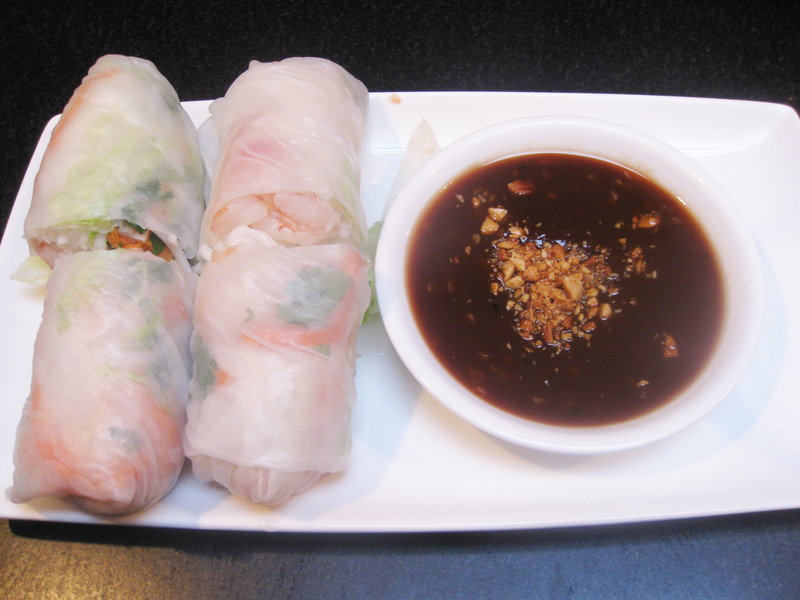 I shared the Goi Cuon Tom (Prawn Rice Paper Rolls) with Peanut Sauce and Nem Nuong (Pork & Lemongrass Meatballs) with Nuoc Cham as a starter. 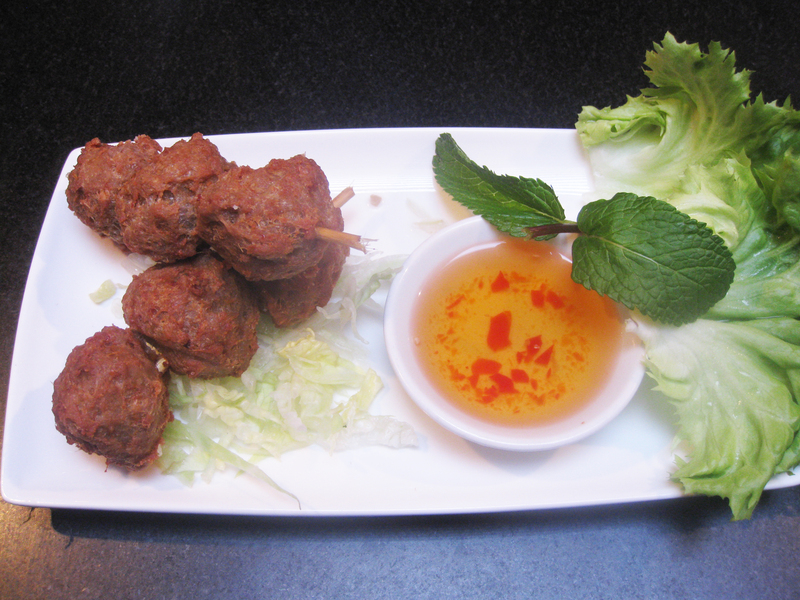 I like Rice Paper Rolls to have more herbs in them but they were lovely and the meatballs were great – with lots of lemongrass flavour. Then I had the Bun Tom Hue (Hot & Spicy Prawn Pho) and it was utterly delicious. Fiery and fresh with great flavours. Pho prides itself on their fresh ingredients and deservedly so – the coriander leaves and beansprouts, which can all too often look and taste limp, were wonderfully fresh. And I had a deliciously fresh Pineapple, Apple & Mint juice with it all. There’s a great range to chose from and everything bar the Bun Noodles, Pho Xao and Banana Fritters is all gluten-free (and you can request gluten-free Bun Noodles and Pho Xao) but you do need to make sure you avoid extra hoi sin, ginger soy or soy sauce. And, of course, it’s all dairy-free. The staff are lovely – and the place is great. You can also order Pho to Go. The Pho Noodle Soup comes in 3 separate containers so that it’s at its freshest when you eat it. You add the noodles to the stock cup, then add the onion, beansprouts and topping and then the toppings – the spring onion, herbs, chilli and lime. Excellent! This is a great mid-week supper for the family which can be made mostly out of ingredients from your storecupboard. You will need a large wok for this one, though, as you need space to stir-fry the egg at the end. 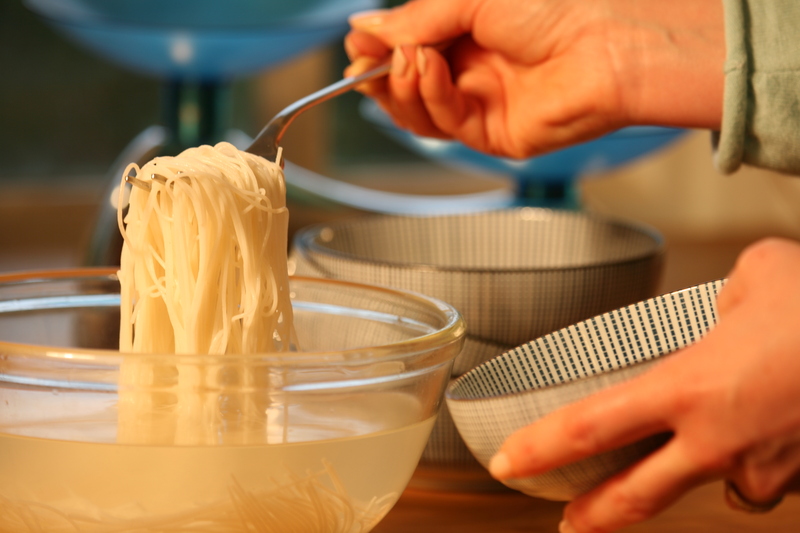 Put the noodles in a large heatproof bowl, cover with boiling water and leave to stand for 5 minutes until soft. Tip into a colander and rinse well with boiling water. Meanwhile, heat 1 tablespoon of the oil in a large wok until hot. Add the chicken and cook over a medium heat, stirring continuously, for 5-6 minutes until lightly browned and cooked through, then remove and put on a plate. Rinse and dry the wok and pour in the remaining tablespoon of oil. Turn up the heat and heat the oil until hot, add the ginger, chilli and garlic and stir-fry for 30 seconds, stirring continuously. Add the pepper and continue to stir-fry for 2 minutes, stirring all the time. Stir in the curry powder, spring onions and prawns and stir-fry for a further 2-3 minutes. Add the chicken and noodles and pour in the tamari and stock, and stir in well. Push the noodle mixture to one side of the wok and quickly add the egg to the other side. Stir-fry for 1-2 minutes until cooked through, then stir into the noodle mixture. Sprinkle over the coriander and serve immediately.